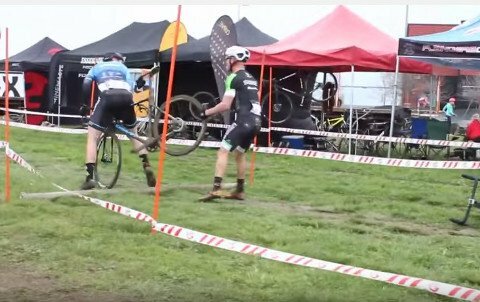 In a bit of unsportsmanlike conduct, two mountain bikers during the finale of the Australian Cyclocross Championships got into a tussle toward the finish line. Nearing the last stretch of the race rider Chris Jongewaard and Paul van der Ploeg locked up handlebars on a tight corner and there appeared a bit more body contact then might have been necessary. Once van der Ploeg broke lose, in a fit of frustration Jongewaard grabbed his back tire. The former mountain bike cross country world champion, van der Ploeg managed to take the victory.